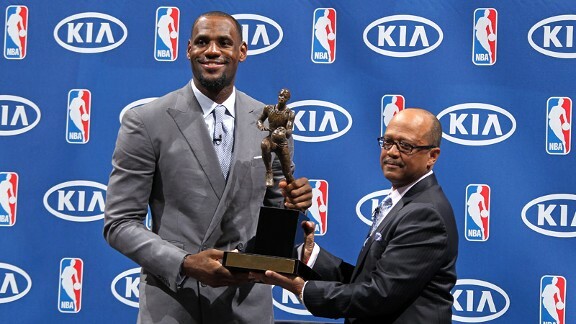 The Miami Heat’s forward LeBron James was named the MVP of the 2011-2012 NBA season on Saturday, May 12, 2012, making this the third time James has won the award. LeBron James became the first Miami Heat player to win the MVP award, and he graciously accepted the trophy in front of the media and his teammates. “I haven’t been nervous like this in a long time,” James said. “I don’t know why. I just think back to where I come from.” James, hailing from Akron, Ohio, is one of only eight players in NBA history to win the award three or more times. This short list of players includes legendary players like Michael Jordan, Larry Bird, Magic Johnson, and Oscar Robertson. A great list to be a part of, right? Unfortunately, he is also the only player out of this eight that has not won a championship, which he addressed during his acceptance speech. “We have a bigger goal,” James said. “I want that championship. That’s all that matters to me.” He even mentioned that he would give all his three MVP awards back for a championship. James received a total of 1074 points, including 85 first-place votes, in this MVP race that was tallied from 120 sportswriters and broadcasters and one NBA.com MVP fan vote. Players were awarded 10 points for each first-place vote, seven points for second-place, five for third, three for fourth, and one for each fifth place vote. Rounding out the top five in order in voting are Oklahoma City Thunder’s Kevin Durant, Los Angeles Clippers’ Chris Paul, Los Angeles Lakers’ Kobe Bryant, and San Antonio’s Tony Parker. In this shortened season of NBA due to the lockout, James posted impressive numbers and led the Heat to a 46-20 record and the second seed in the Eastern Conference Playoffs. He averaged 27.1 points, 7.9 rebounds, and 6.2 assists. He shot career-best 53 percent from the field and 36.2 percent from three-point field as well. He was named Eastern Conference Player of the Month in January and February and Eastern Conference Player of the Week six times.